Christmas is just around the corner and it is all too easy to get distracted by the festivities. Endless Christmas drinks parties and last minute shopping to contend with. While few companies hire in December, there are a handful of ones that definitely take on extra staff to contend with the busy season. However, even if your industry of choice is one that hibernates over the holiday period, here are 5 ways to keep your job search going and use your time wisely. By the time January comes around you’ll be perfectly poised to launch into your new year job search. 1. Meet with friends and ex-colleagues. Take advantage of the fact that reaching out to out-of-touch friends and ex-colleagues is not uncommon. 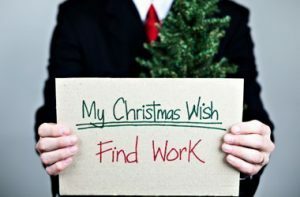 Send a Christmas card, letter or email to all your contacts letting them know that you’re in the market for a new job. Be upbeat and optimistic and offer to help out if they have any work going. It is the time of year when there are endless office parties and festive drinks. Use these to reconnect with old school friends, neighbors, past teachers or your former sports coaches. Sometimes telling people you’re unemployed can feel awkward and uncomfortable but if you put a positive spin on it and approach it with enthusiasm there is nothing to feel conscious about. 3. Say Merry Christmas (Or Happy Holidays) to recruiters. It’s always nice to spread the festive cheer and it’s a great way to remind recruiters that you’re around and still looking for a job. There are many people that are less fortunate than you and the holidays are a great time to give back if you’re out of a job. Not only does it keep you busy and productive, but prospective employers will be impressed. As a bonus, it will put life into perspective and remind you that life isn’t so bad after all. Tagged under: job search,	office party,	temporary work.